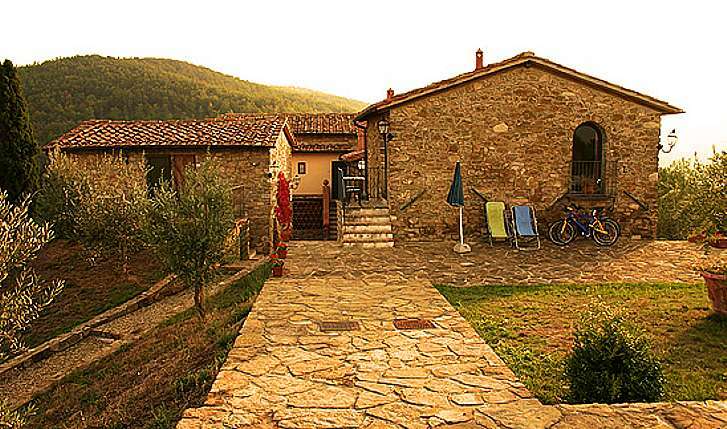 This is the perfect places for stunning 360° views of this beautiful Tuscan area. There area 6 self catering apartments all with private outdoor terrace and complete kitchen. 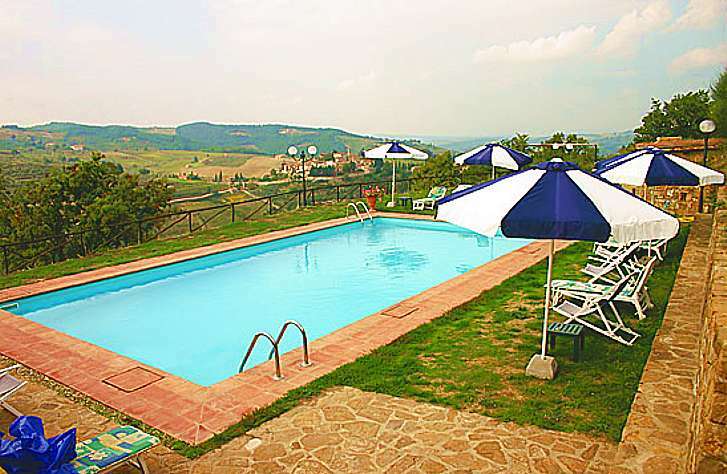 The pool is in a stunning position over looking the medieval hill town of Montefioralle. 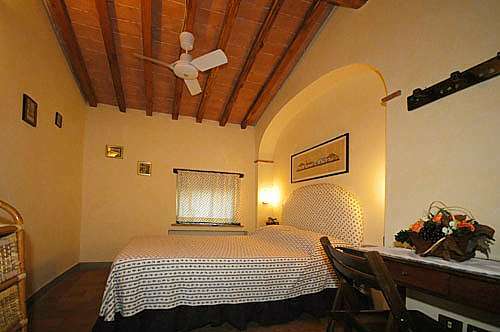 Each apartment has maintained the special Tuscan characteristics like beamed ceilings, open fireplaces and hand made Cotto tiles on the floors. 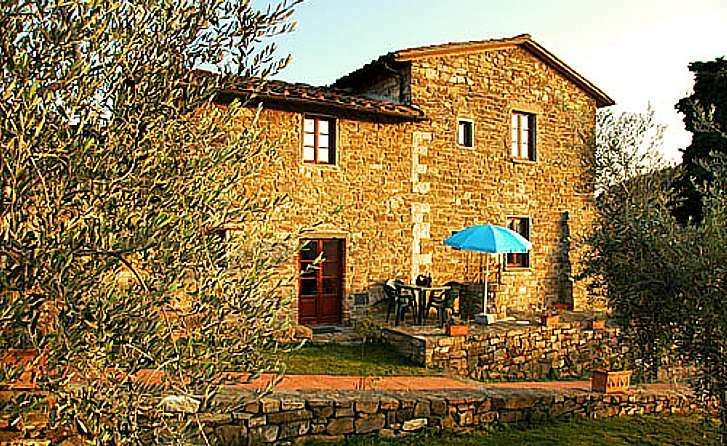 For those looking to enjoy the country side CASTELLO GONZI is within walking distance of Greve in Chianti and Montefioralle. 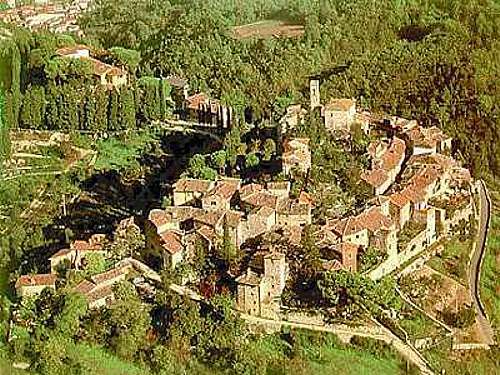 CASTELL GONZI is a hamlet or “borgo” a small village built around a fortified castle in the close surroundings of Greve in Chianti dated back to the twelfth century. This place was a strategic position for communication between Florence and Siena. 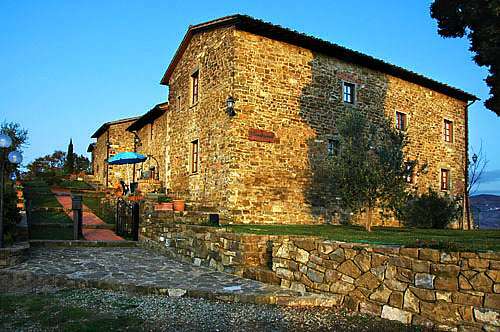 The castle has been destroyed during a battle between a Florentine and a Sienese city war in the 1600’s but the hamlet with its separate houses remains. 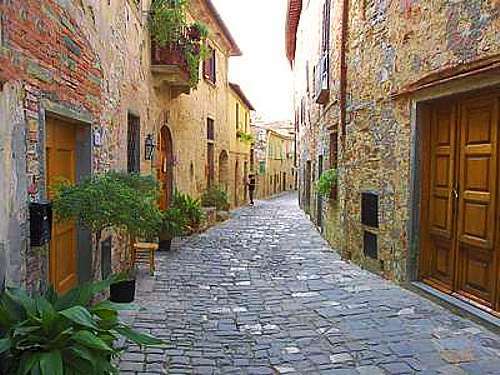 They have been restructured and transformed into a delightful Tuscan Borgo (a very small Tuscan village composed of only some houses) with 7 different apartments, decorated in Tuscan rustic style preserving its original features. Balcone remains in the back of the small building towardson the first floor, with external stairs and entrance by the side. There is a living / dining room with a kitchen corner and a single sofa bed. 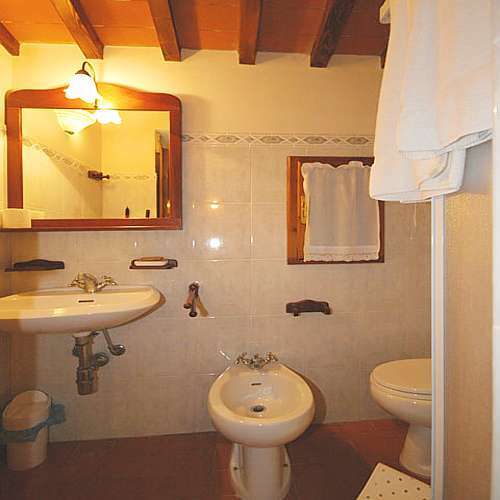 Then you have a double bedroom and a bathroom with shower box, WC, bidet and sink. In the courtyard you have a private garden space with a table, chairs and sun-umbrella. 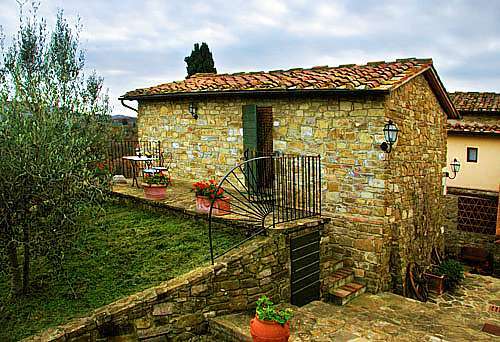 The name “Balcone ” derives from its small balcony and French door with large window facing the courtyard. This apartment is perfect for a couple looking for privacy and comfort. 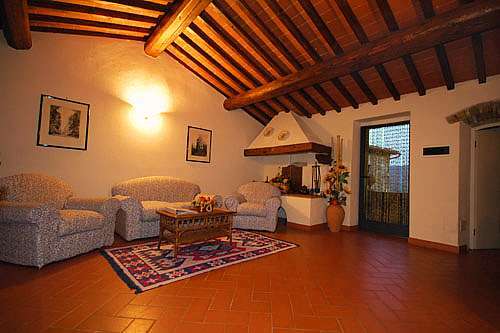 This apartment stays on the first floor, above the apartment Stalla, located in the second central building. It has an external staircase that leads to the entrance. You step in a living / dining room with kitchen corner and a single sofa bed. 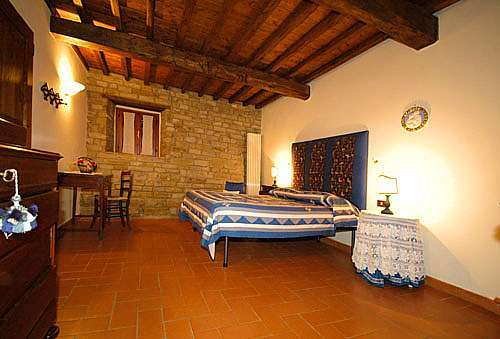 From there you access the bedroom with a queen size double bed and a bathroom with WC, bidet, sink and shower box. Its outdoor area is a balcony type terrace right in front of the entrance. 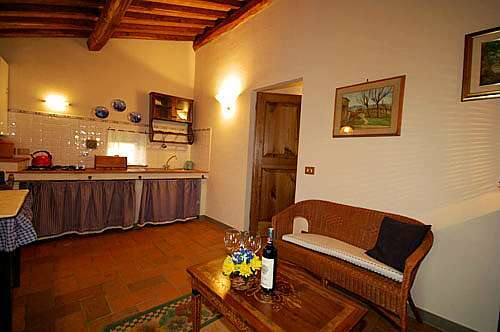 There is a laundry room with washing machine, iron and iron board for free and common use to all guests. This apartment stays on the ground floor of the second central building, the entrance opens to a large living / dining room with a complete kitchen corner. Each apartment has a kitchen composed of 4 burner gas stove, oven, fridge and stainless steel sink. 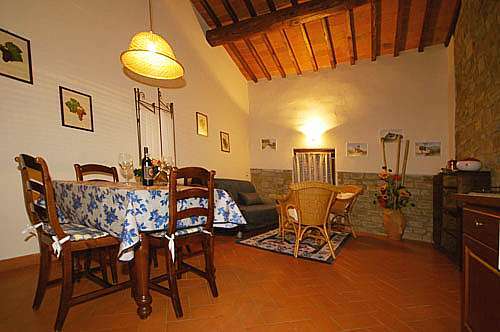 You will find all kitchen and table ware to prepare a full Tuscan dinner. In the living room you have a single sofa bed, just in case a friend is visiting you or for a child. Than up 3 stairs up there is a master bedroom with queen size double bed and a bathroom with shower box, WC, sink and bidet. 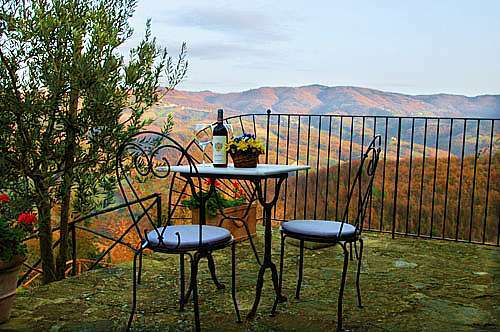 STALLA has its own outdoor area not right next of the apartment, but 30 m from in a panoramic position of the garden overlooking the valley and the pool area. This private covered terrace, a wooden gazebo has table and chairs. 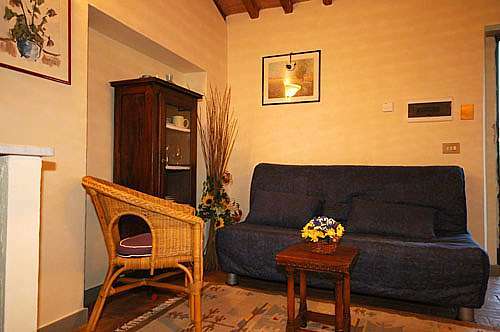 Each apartment has SAT-TV with English, German and Italian programs. 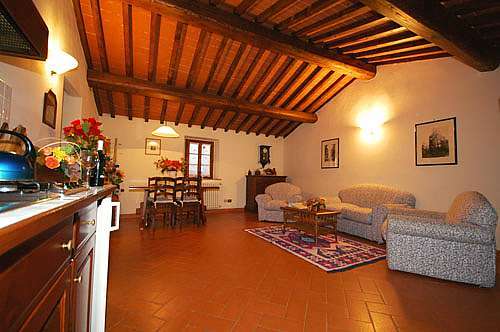 This apartment stays on the upper ground floor of the first central building. A splendid double stone stair leads from the right and left garden side you up to the entrance which is set right in front of the building. 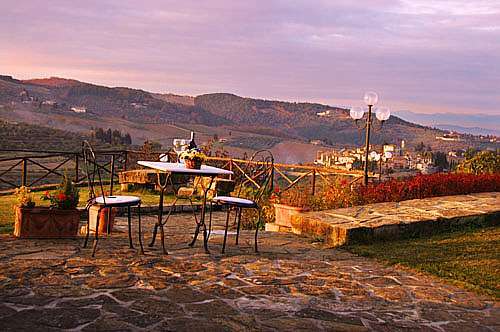 On this terrace you also have your private outdoor area with a sun-umbrella, table and chairs. FRANTO is the largest of the 2+1 people apartments. The entrance opens to a spacious living / dining room with a single sofa bed and a complete kitchen corner. 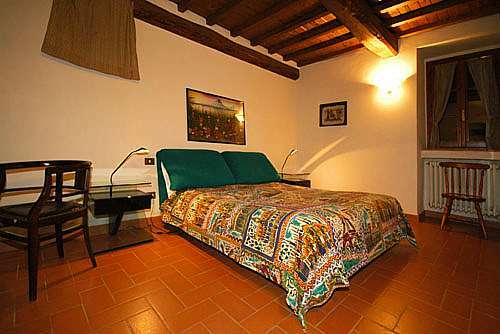 From there you access the master bedroom with a queen size double bed. 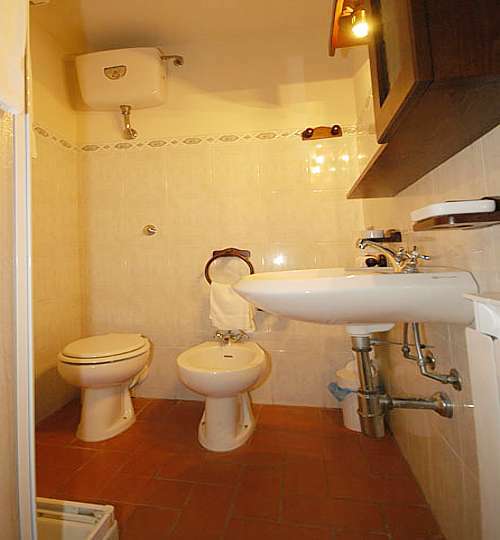 The en suite bathroom is equipped with WC, bidet, sink and shower box. In all apartments on request you can have a crib for a baby or one more extra bad. This apartment is located on the ground floor of the first central building next to Franto. From the entrance you enter a spacious and luminous living / dining room with complete kitchen corner and a double sofa-bed perfect for a couple. 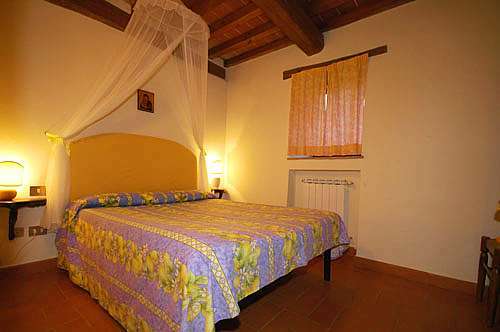 In the back there is one bedroom with a queen size double bed and a window with great views of the valley below. The bathroom is equipped with sink, WC, bidet and shower box and in all bathrooms you have a hair dryer. The private outdoor area stays right next to the entrance door, where you have a private dinning area with sun-umbrella, a table and chairs. All apartments have a covered parking space. 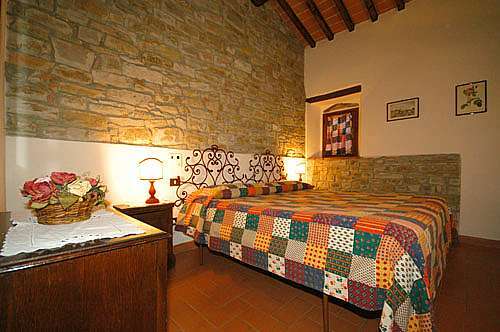 TINAIA is perfect for a couple with kids or 2 couples. 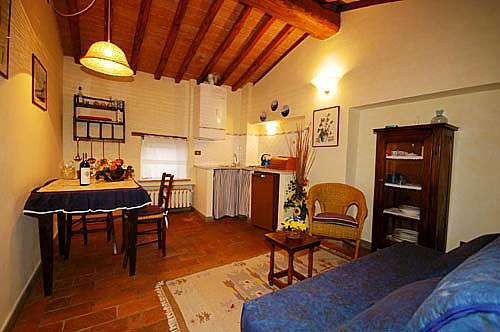 This apartment stays on the first floor of the first central building, right next to apartmnet Camino. An external staircase takes you up to the main entrance, where you step in a splendid living / dining room with a sofa bed for 2 persons. 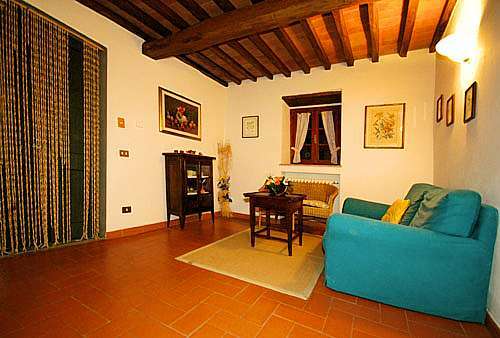 This apartment is located on the first floor of the first central building, right next to apartment Pigne. The external staircase takes you to the main entrance, where you have a large living / dining room and a complete kitchen corner. 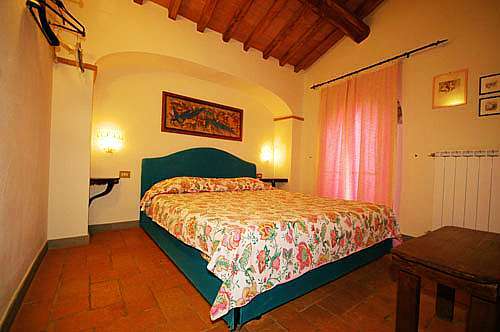 In the back there is one bedroom with a queen size double bed and one twin bedroom with 2 single beds. 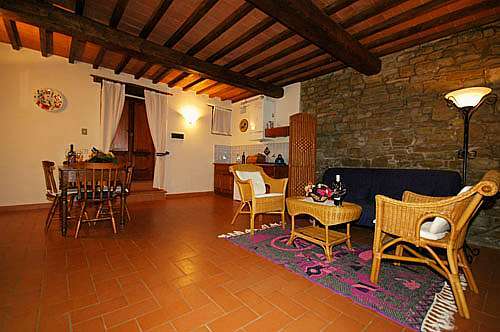 Pigne and Camino can be converted into one large apartment for 6+2 people (2 bedrooms with a double bed, 1 bedroom with 2 single beds and 1 sofa bed for a couple) in case you rent both apartment together you will get a 10% reduction on the price!! 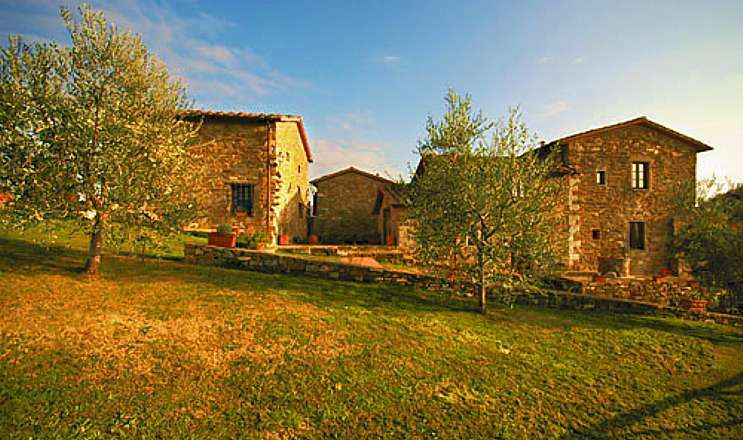 See also Capella, an independet cottage located a few meters from Castell Gonzi, same owner. IMPORTANT: For this property the periods of Christmas, New Year and Easter are considered HIGH SEASON. This is a single bed, with a sliding extra bed below it). 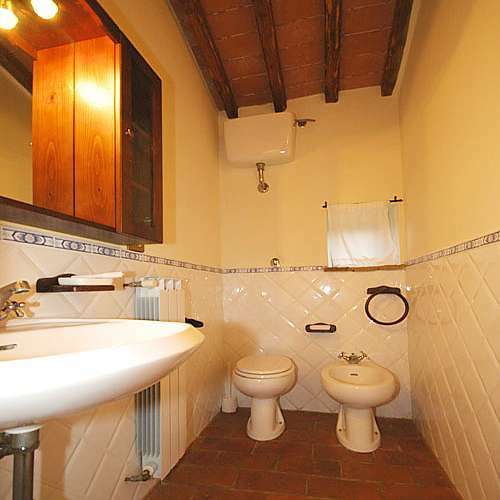 Each bedroom has its own private bathroom and WC, sink bidet and shower. Camino has its private outdoor area not in front of the apartment, but 30 distant in a nice and panoramic part of the garden. 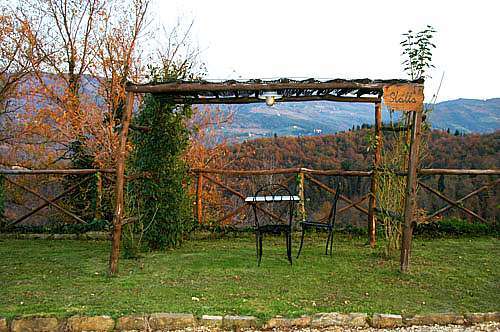 The wooden gazebo (a covered terrace) has a table and chairs. FRANTO and TINAIA can be converted into one apartment for up to 7 persons (2 bedrooms each with a double bed , 1 double sleeping couch and 1 single sleeping couch). In case you rent both apartment together you will get a 10% reduction on the price!! 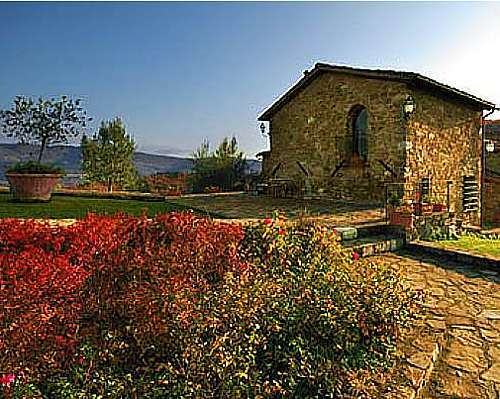 The property is located in a special position, on the hills of Chianti area, among vineyards and olive groves. 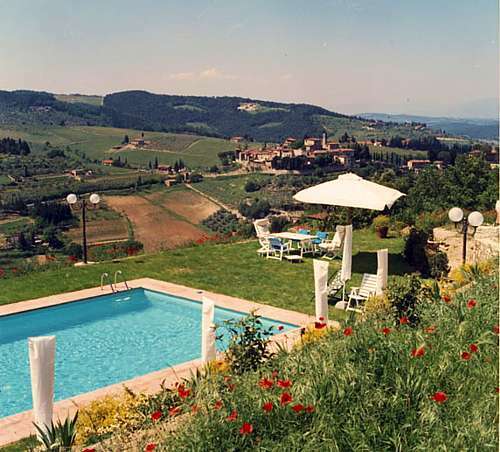 There is a shared swimming pool (12 x 6 m large and 1,5 m depth), a spacious garden with tables and sun-umbrellas, parking area, barbecue and a common laundry. 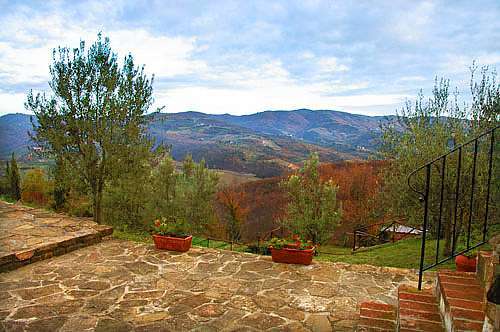 Moreover, it is possible to take beautiful walks, horse riding and cycling tours. 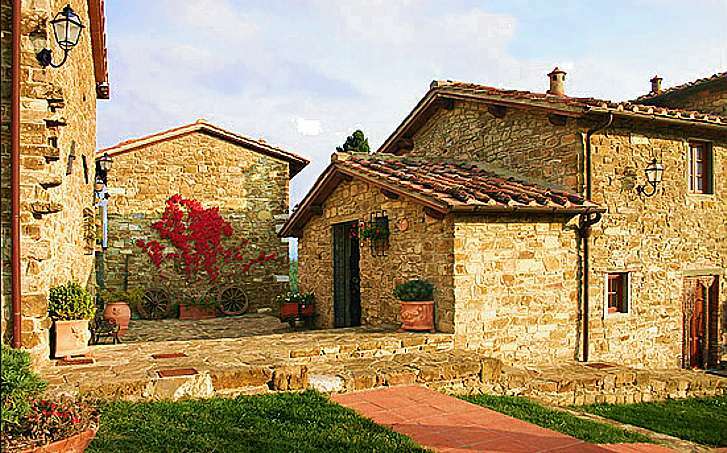 The owners can also organize dinners by the pool and wine tasting tours in Montefioralle, one of the most beautiful hamlets of Tuscany that can be reach by foot (about 1 km). 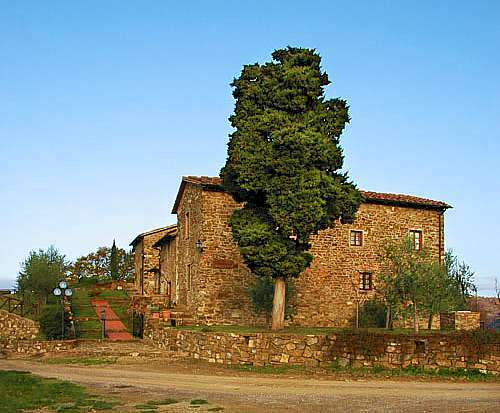 In total there are 3 different buildings, the first one is the larger building with a large cypress tree. 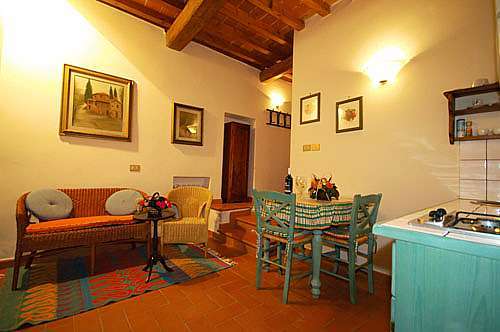 Here you have the reception and the apartments Tinaia and Franto on the ground floor and Camini and Pigna on the first floor. The next building is a bit smaller and holds the apartment Stalla on the ground floor and Ruota on the first floor. 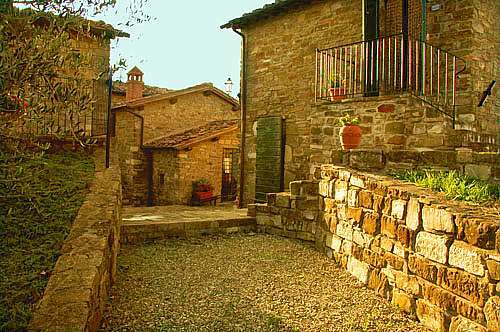 The last and smallest house is a cottage where the ground floor apartment hosts the care taker of the estate an on the first floor you find the apartment Balcone. The area was fabulous. The villa apartments were great and we would go back to this area again. We were there a week and had a wonderful time. The grounds were very nice and the view was amazing. If considering walking into the town of Greve ...the walk in is downhill and not so bad but you need to be in perfect shape for the uphill trek back.Greve is the only town within walking distance in my opinion...but then I'm an out of shape Canadain!